What is asphalt seal coating? 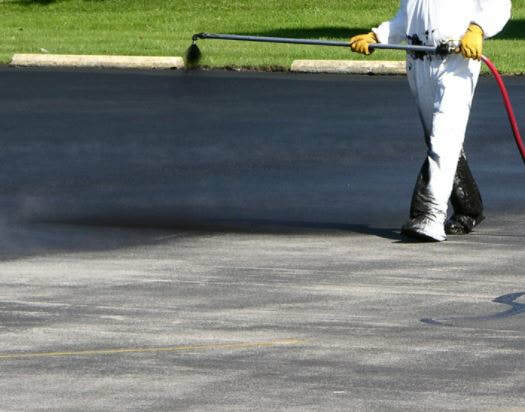 Asphalt seal coating entails applying a special liquid material onto already existing asphalt. This provides a barrier for the asphalt and protects in from a variety of elements such as rain, ice, and UV damage. Providing protection from these elements and more, allows the asphalt to stay intact for longer. There are numerous benefits to seal coating an asphalt surface, your driveway in particular. Why do you need to Seal your driveway? Allowing us to provide you with a professionally done driveway seal coat, will help prevent cracks from forming, creates a smoother surface, helps slow down oxidization which would cause asphalt to deteriorate over time, and produces a more aesthetically pleasing driveway. Having a seal coat on your driveway will not only protect your driveway from the sun's potentially damaging UV rays, It will also help protect it from chemicals such as oil and gas. How long will the seal coat last? How long the seal coating lasts will depend on a number of factors. The amount of rain, ice and heat that impact your driveway can all have an effect on the seal coat. On average reapplying a seal coat is recommended every 3 to 5 years. We would be able to give you a more precise estimate of how long your seal coating will last upon consulting with you on the area you would like seal coated. While there is no perfect weather conditions for seal coating a driveway or using a seal coat in road work, there are a few basic standards. It's best to wait for at least 24 hours with the temperature holding at 50 degrees or above. The area needs to be completely dry, taking into account fog and high humidity. We would be happy to provide you with more specifics regarding the best time to lay down a seal coat and how long it could be expected to last in your particular situation. Deciding whether to do the seal coating job your self or hiring asphalt seal coating contractors, is a decision many people may struggle with. The asphalt seal coating cost per square foot when doing it by yourself, on paper may appear to be significantly cheaper than hiring a contractor. Doing it by yourself entails buying all the necessary drive way seal coat products, which include gloves, a broom brush, a squeegee, a cleaning agent to prepare the surface, crack filler, and the seal coat material its self. Depending on the quantity, brand purchased, and when they're purchased, these items could potentially total a few hundred dollars. Many people find that it's well worth the cost to hire a contractor and get it done professionally. Along with a properly seal coated driveway, you will have the piece of mind that it was done professionally and you have had all of your questions answered. Unless you have experience in seal coating asphalt, you may wish to consider hiring South Bend Seal Coating to ensure the job is done correctly and lasts longer.